Machine learning and artificial intelligence is an exciting area of emerging technology. The applications for machine learning algorithms are nearly endless. From early OCR algorithms that can read the text from a picture or scanned document to IBM’s deep blue, machine learning has been evolving constantly to allow computers to find solutions to problems directly, instead of having programmers design and write the solutions. It is a technology that can be readily applied to problems that have more input that is manageable by a more traditional software solution. Our first foray into machine learning was in the development of our own spam filter. We put the filter in production and it quickly learned how to weed out the worst of the spam. After a few years in service, the filter is now well tuned to the subject matter typically discussed by our mail server users and can finely filter the inbound messages it receives. Bolstered by that success, we sought to create more opportunities to design and apply a broader variety of machine learning algorithms to more complicated problems. Robotics, the creation of moving computer equipment, is an obvious choice for implementing myriad learning algorithms such as locomotion, computer vision, pathfinding, language emulation, and conversation. We set a goal of creating a viable humanoid robot that would serve as a hardware platform for the development and testing of experimental machine learning algorithms. We purchased an inexpensive Prusa i3v 3D printing kit online. Once assembled we began to create object on the computer, and realize them physically in a matter of hours. This new manufacturing capability opened the doors for us to develop physical devices from scratch in a very short period of time. We set our sights on creating a hardware platform that could be the gateway to designing and implementing a broad spectrum of machine learning software. 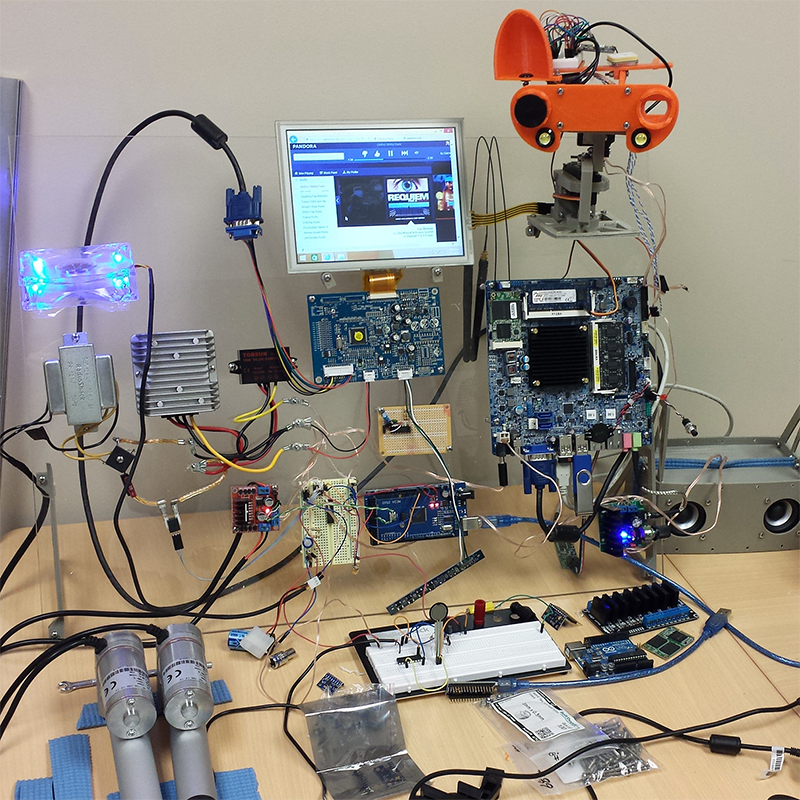 The humanoid robot project, named Nephele, was quickly underway. We sourced a variety of components ranging from 12v PC hardware, several flavors of Arduino, GPS receivers, accelerometers, gyroscopes, motor controllers, gearmotors, linear actuators, bearings, voltage regulators, LiPoly cells, many IC chips, breadboards, and the list continues. 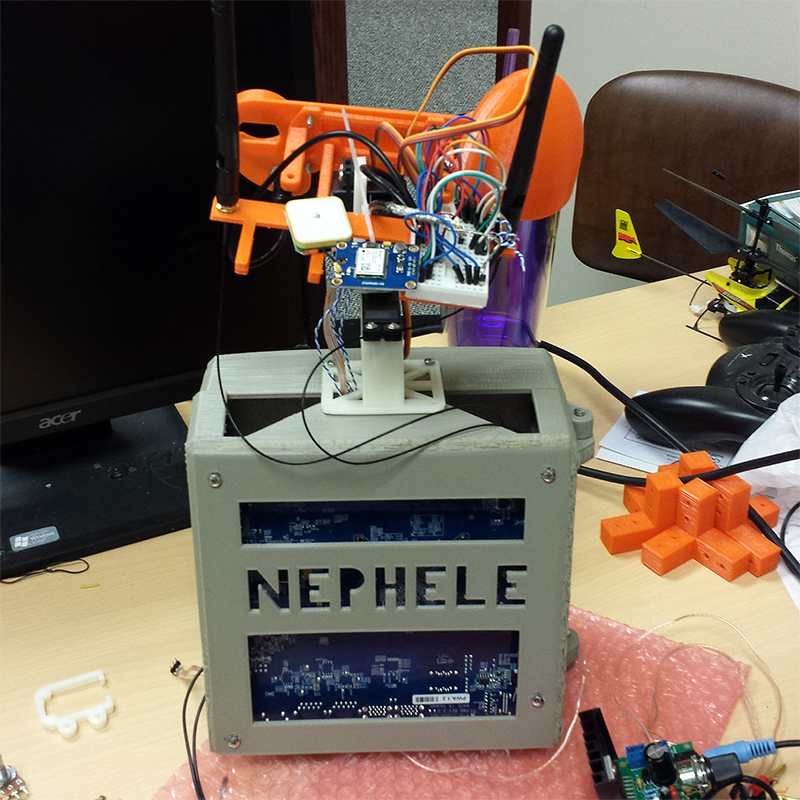 Attempting to pack the hardware into a robot torso was our first iteration of Nephele. After the torso was informative, but not ultimately strong enough to support limbs, the hardware was affixed to an acrylic sheet so the wiring could be simplified to move the focus onto the software for a while. We created a shoulder which implemented two linear actuators and five universal joints to give it a 2D range of motion, like a human shoulder has. Linear actuators proved to be too cumbersome for the range and rate of movement we desired so we devised a new mechanism to allow the computer to move more fluidly. This new mechanism requires many electromagnets, so we build a machine that can carefully wind ultra-fine magnet wire onto ferrite cores. The machine that does the winding has to carefully manage the tension on the wire to prevent it from breaking, and uses infrared optical encoders to sense the tension and adjust the feed rate of the wire from the spool. The electronics that controls the device spread to two breadboards and a soldered prototype board and became unwieldy. 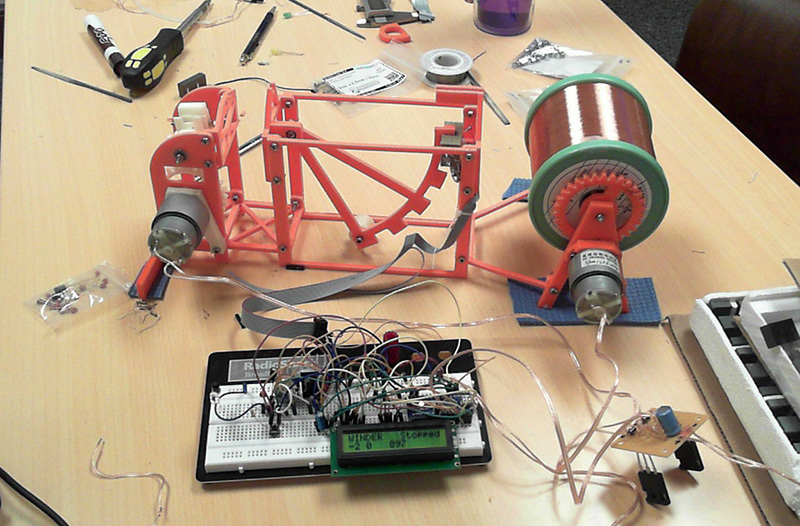 We needed a way to design and manufacture prototype circuit boards quickly. We decided we would need to be able to mill our own circuit boards to further augment our prototype manufacturing facilities. The mill quickly expanded to a 2m x 2m work surface and the structure of the first version was rapidly fed to our 3D printer for fabrication. Once assembled, the table became usable, but limitations in the structural engineering of the system would require a second draft. The first version was functional enough to fabricate some of the components that would be used to make the table much stronger. As the complexity of the devices we’ve build has increased, we’ve been forced to lean harder on computer modelling and testing prior to 3D printing to eliminate time-consuming mistakes from slight misalignments. 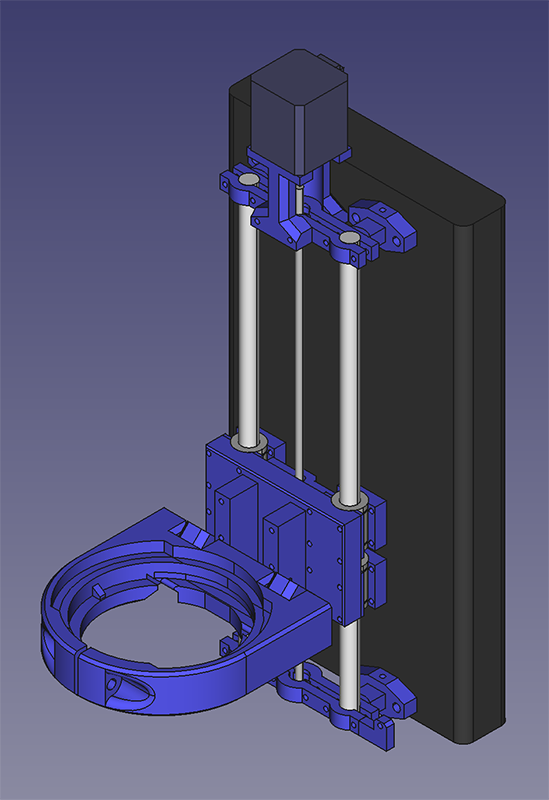 The Magnet winder and the CNC mill really solidified the need to assemble prototype parts digitally before assembling their real-world counterparts. © 2013-2019 Whitman Technological Corporation - All Rights Reserved.